To achieve the SDGs, the world community has agreed on a set of indicators to measure progress. This process has identified a range of indicators that tap critical aspects of the SDG Agenda, but for several of the goals, and perhaps particularly for SDG 16, the current crop of indicators still falls short of covering the full letter and spirit of the goals. 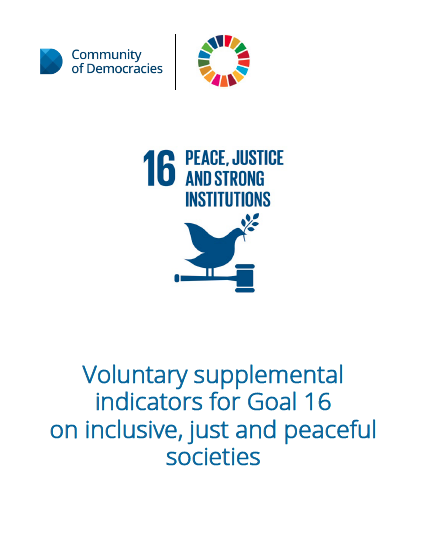 Answering the specific call for such efforts set out in the Agenda 2030 Declaration, this voluntary supplemental indicator framework develops a set of SDG 16 indicators to better measure critical aspects of peaceful, just, and inclusive societies. It draws on a range of international normative frameworks to inform the supplementary indicator framework, but puts special emphasis on the Community of Democracies’ Warsaw Declaration. SDG 16 will affect progress towards the other SDGs, and a supplemental indicator set for SDG 16 will therefore also supplement the other SDG indicators. In deciding between indicators, we rely on the following criteria: relevance, simplicity, feasibility and policy actionability. This initiative was made possible thanks to the generous support of the governments of the United States, Sweden, and Japan.